A Presidential Committee chairman is expected to pull a few strings, especially when the president of the committee in question is George W. Bush. So when Adair Margo, chairperson of the US President's Committee on the Arts and Humanities (PCAH) arrived in China, she got her chance. Margo led a group of 35 delegates on a visit to China and was impressed by a shadow puppet show given by villagers from Tangshan, Hebei Province. The show was part of the on-going shadow puppet exhibition at the National Art Museum in Beijing, a hub for cultural and political connections this week. Delegates of the US President's Committee on the Arts and Humanities enjoy a shadow puppet show given by villagers from Tangshan, Hebei Province. 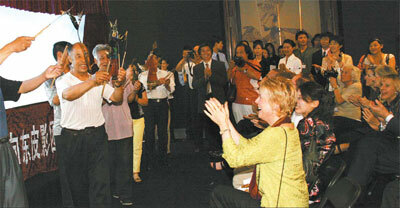 Margo and many of the PCAH committee members had never been to China and were blown away by the experience. "Our stomachs, eyes and brains are all stuffed these days," Margo says. "Many people of the delegation, including me, have not been to China. I have only seen the Great Wall in pictures and it cannot be captured. "It's so amazing to be so close to such rich ancient history. Of course, the influences are everywhere in our country, but coming to the source is quite extraordinary." Margo said she believed in people-to-people diplomacy, and the vital role arts and humanities played in strengthening the ties between China and the United States. "We want to open new opportunities for artists and scholars, and strengthen relationships between our cultural and academic institutions," she says. "When you are dealing with China, you are dealing with such a long history that affected all of us. "I believe the US-China cultural cooperation will have great effect over the world." The group of American VIPs climbed the 2,000-year-old Great Wall, which most of them had only seen in pictures. At the Commune at the Great Wall, a cutting-edge architectural development designed by a group of international architects, the group heard Shan Jixiang, vice-minister of the State Administration of Cultural Heritage discuss the challenges and opportunities of the conservation and preservation of Chinese cultural heritage. At the National Art Museum, delegation members were drawn to the paintings by Lou Shibai, 89, a Chinese master artist who learnt his skills from Qi Baishi (1864-1957). Pictures by the Italian-born and Paris-based fashion photographer Paolo Roversi revealed China's international appeal. The visual gems were the epitome of what Sun Jiazheng, China's minister of culture wanted to show to the US guests. Rich cultural heritage, traditional arts as well as modern art in an age of the economic prosperity were all revealed to the VIPs. Senior representatives from the Library of Congress, the National Endowment for the Arts and the National Endowment for the Humanities make up the PCAH. The visit was an important opportunity for these key decision makers to meet Minister Sun, as well as Chinese officials, cultural administrators, artists, scholars and curators. "The visit reflects that the US federal officials have attached great importance to the cultural exchange between China and the US," says Minister Sun. "China and the United States are thousands of miles away from each other, separated by the Pacific Ocean, having different cultural and historical backgrounds, but it is because we have so many differences that we need to strengthen communication and mutual understanding. "Culture can overcome the barriers of language, ideology and religion to reach people's heart." China's Ministry of Culture selected Shanghai, Beijing and Xi'an as destinations for the group. In Shanghai, they visited the Shanghai Museum and watched a performance at the Shanghai Children's Palace. In Xi'an, the capital of Han Dynasty (AD202-BC220) and Tang Dynasty (AD618-907), the delegation saw the terracotta warriors and the newly opened Hanyang Ling Tombs. They finished their trip in Beijing. In addition to the Great Wall and the National Fine Arts Museum, they visited the Forbidden City, the 798 contemporary art complex and took a "hard-hat" tour through the National Grand Theatre, which will open in May 2008. The Americans were especially dazzled by the food. "The food sold in the Chinese restaurants in the US is very different from the real Chinese dishes here," says Caren Prothro, who serves on the board member of Trustees of the Dallas Museum of Art. "What we knew about China from the books, TV and movies in the US are very different from what we see here." The culmination of the visit was the signing of the Implementing Accord for Cultural Exchange for the period 2007 through 2009 under the Cultural Agreement between the government of China and the government of the United States.